A celebration of the sport of tennis and a spectacle of its most electrifying event, this book brings to life the historical moments, exciting highlights, and overall emotion of the US Open. From the early years of Billie Jean King and Arthur Ashe to current players like Roger Federer and Maria Sharapova, each of these household names have made their mark competing on the game's biggest stage. The pages are filled with background information for each champion, interesting tidbits from their winning years, and highlights from the past four decades. 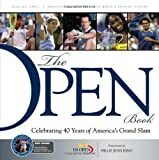 The stunning photographs allow readers to feel the enthusiasm that surrounded each champion during their journey to victory, and the accompanying US Open Court of Champions DVD features video tributes to the 15 greatest singles champions in the history of the US Open with footage never made available before.